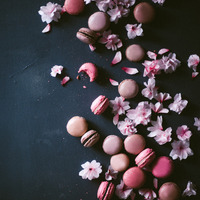 What started as a cherry blossom macaron quickly turned into something else. The original mix was a bit lighter in flavor but I ended up liking certain parts of the vape so much I wanted to emphasize them. The main aspect of this is a certain in your face PINK flavor. There is also an almost cereal note with a bit of crunchberries in there. TPA cherry blossom and CAP hibiscus blend together to create a sweet, airy, cherry pink floral note with a bit of syrup on top. FA almond adds body to this pink note and lends it's own cherry note through our own minds associating almond extract with cherries. My best example of this phenomena is eating a big pint of ben and jerry's cherry garcia. This stuff is loaded with almond extract. FA meringue adds a powdered sugar note, body, and acts as a condenser to the whole mix. FA cookie adds a bit of texture and keeps the mix from being too one-note. Cap Butter Cream works really well here, it actually has this unique taste when combined with meringue where it creates an almost delectable creamy filling and separates from the powdered sugar. The suggested steep time brings out complexity but this mix is good day 1 for me. This recipe is the property of shyndo and released under the CC Attribution-NonCommercial-NoDerivatives 4.0 license. You may not copy, derive or commercialize this recipe without following the terms of this license or the explicit permission of the creator. You sir are a magician! This is amazingly delicious. I really expected more of a dense cookie, which I like, so that was fine. This is so incredibly light and delicate that it blew me away. I feel like I am vaping an actual macaroon! Thank you for this gem. This was one of those vapes that when mixing it I expected one thing, and then after vaping I asked myself "wtf did I just vape?!" But in a good way. I expected, as Shyndo mentioned, A light cookie/macaron with the floral notes of the Hibiscus. What I got, what something else so spectacularly awesome. I don't know if it was the almond being where it is or what, but it pulled it away from a cookie and turned into more of a cereal. What I get from this is almost a light crunchberry cereal, that doesnt use the premade berry flavors. I feel pink, I see pink, I taste a pink berry cereal, I think this did what it set out to do, in the most awkward of ways. Thanks for letting me beta test it, sorry it took so long to review. Incredible recipe. I get some cereal, and bright floral notes. I keep this mixed up ever since I tried it. This is super pink and I can't put it down. I think this is what love tastes like. <3 Amazing work. Shyndo has created a recipe that can turn ordinary folks into synesthetes. I challenge anyone to vape this and not see pink. It's is so interesting and delicious I wanted to write a song about it after just a couple of hits, but after a couple more I remembered Steven Tyler had beat me to it: https://www.youtube.com/watch?v=ZfbBqBOSXlU .